Mandalay Bay Resort and Casino is a 44-story luxury hotel casino. Five floors (floors 35–39) of the main hotel building are occupied by the five-star and AAA Five-Diamond Four Seasons Hotel Las Vegas. The top 3 floors (numbered as floors 60-62) are penthouses, with a penthouse lounge on level 62 for guests staying in the penthouses. It is connected by the free Mandalay Bay Tram to its sister properties, Excalibur and Luxor. Mandalay Bay has 3,309 hotel rooms and a casino of 135,000 sq ft (12,500 m2). The adjacent Mandalay Bay Convention Center has almost 1,000,000 sq ft (93,000 m2) of space. In addition, the Mandalay Bay Events Center hosts events including boxing, the UFC’s MMA pay-per-views and concerts. It hosted the Latin Grammy Awards in 2007, 2009 and 2010. It will be hosting it up until 2012. It is owned by MGM Resorts International. Casino: Yes, 135,000 square feet. Casino games include Blackjack, Caribbean Stud Poker, Craps, Let It Ride, Pai Gow Poker, Poker, Roulette, Slots, Baccarat, Megabucks and Super Megabucks. More than 2,400 slot/video poker machines, 122 table games. The casino has a poker room. Race & Sports Book: Yes, a 300-seat race and sports book, equipped with 84 televisions and 17 big screens. Restaurants: Mandalay Bay has the following dining options: Aureole, Bay Side Buffet, Beach Bar & Grill, Border Grill, China Grill, House of Blues, Mizuya, The Noodle Shop, Orchid Lounge, Raffles Cafe, Red, White and Blue, Red Square, Shanghai Lilly, StripSteak, Trattoria del Lupo, Sports Book Grill, Fleur and a food court in the convention center area. There are also a two Starbucks (one near the convention center and one at the entrance to Mandalay Place) and Yogurt In. Additional restaurants located in the Mandalay Place shopping area: Hussong’s Cantina, The Burger Bar, restaurant rm, Rí Rá and r bar café. In THEhotel there are the cafe, the coffee bar and Mix. Entertainment: Entertainment includes headline acts in the 12,000-seat events center or on Mandalay Beach, the House of Blues live music venue (approx. 1,500 people) and three lounges. Steel Panther performs every Friday night at House of Blues. Mandalay Bay is also home to The Lion King. Michael Jackson – The World Immortal Tour will be appearing at the Mandalay Bay December 4 – 27. Nightlife: Foundation Room, Late Night at House of Blues, eyecandy, Mix Lounge and Minus5. There are also two frozen drink stations on the property with evening call located near the Lion King Theatre and a Fat Tuesdays in Mandalay Place. Attractions: The Shark Reef is a $40 million aquarium covering more than 90,000 square feet that holds more than 1.5 million gallons of seawater and 100 species of animals. Pool: Yes, 11 acres of beach environment that include three pools, a lazy river, an adult-only pool at Moorea Beach Club and a 1.6-million-gallon wave pool with a sand-and-surf beach. Health Club or Fitness Equipment: Yes, a 3,000-square-foot fitness and personal training center. A second health club is located in THEhotel, a new all-inclusive tower at the resort. Spa: Yes, there are two. The 30,000-square-foot Spa Mandalay with 21 treatment rooms offers multiple types of massages and services. The spa also has a full-service salon. The 14,000-square-foot bathhouse spa in THEhotel offers multiple types of massages and services. A full-service salon is located outside of the spa in the adjoining Mandalay Bay hotel. Shops: Yes. A hotel and House of Blues gift shop, Pearl Moon Boutique, jungle juice, Rangoon News Bureau, Oro Gold, M Logo Store, be jeweled, Davidoff, Jack Gallery and Fight Museum, which features Mixed Martial Arts-associated clothing brands, collector’s items and more. There are also 41 shops and restaurants located in Mandalay Place, an upscale boutique mall that connects Mandalay Bay to the Luxor. Wedding Services: Yes, the THEwedding chapel offer a number of wedding ceremony packages. Convention Rooms: Yes, a 1.8 million-square-foot convention center. In-Room Internet Access: Each room has a phone jack for dial-up internet access. Hotel Amenities: Dollar Rental Car on-site, beauty salon, concierge, currency exchange, laundry service, luggage service, maid service, safety deposit box, valet parking and wake-up call. Shuttle Service to the Strip: There is a monorail that passes from Excalibur to Mandalay Bay. Standard Room Amenities: Air conditioning, alarm clocks, remote-controlled cable TV, desk, electronic door locks, hair dryer, iron and ironing board, pay-per-view movies, radio and telephone. 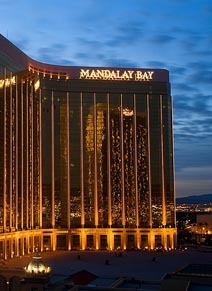 Incidental Charges: Mandalay Bay Hotel & Casino has a $20 per room, per night fee to cover the cost of in-room internet access, access to the Cardio Center, unlimited local and toll free calls, daily newspaper, boarding pass printing and outgoing faxes. Hotel requires a credit card or a cash deposit for incidental charges.The resort fee listed above does not include tax.